It is important to remember that supporting structures form the basis of the strength of any building. There are several situations in which you want to strengthen a bearing wall. If you want to build a doorway in the supporting wall or restore the wall, which from time to time or external factors can not properly carry the entire load assigned to it, it is important to strengthen it in accordance with all standards and regulations. Rarely and yet there are times when you need to additionally strengthen the supporting structure, for example, if initially there were mistakes in the design or in the construction of the building. A wall or ceiling can be strengthened in several ways. One of them is the external strengthening based on the use of composite materials involving high strength carbon or fiberglass material, secured with epoxy resin. However, this option is not suitable for strengthening in domestic and residential buildings and is more suitable for industrial facilities. The second option is the gain using the metal structures. To strengthen the walls of the coupler used metal angles, channels and I-beams. It is possible that just deepens the channel in the perimeter wall and welded to a solid frame, which is taking over part of the load. When it comes to the entire building is formed by a solid belt of metal that tightens the external load-bearing walls. All reinforcements are fixed to the wall and neighboring structures by using embedded elements such as rebar or a long stud embedded in the wall. 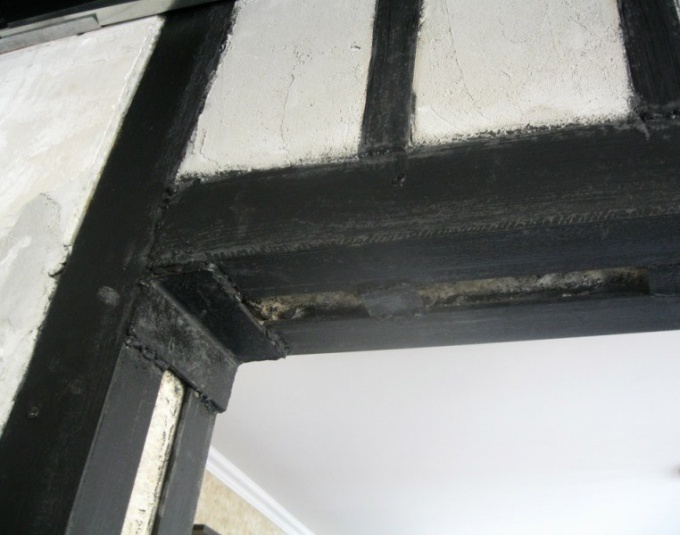 The gap between the wall and the strengthening must be filled with concrete, and the metal is covered with a protective primer. If you need to cut an opening in the supporting structure, and shall be strictly enforced due to the strengthening of the opening to the reliability of the wall was not damaged. The gain in this case is performed around the perimeter of the opening and of the future before it will break. As with conventional gain, used angles, channel and beams. Most often used channel, which can accommodate in its inner part the whole thickness of the wall. The channel is laid in the prepared slits in the wall, first upper and lower cross member and after the backup. All parts are welded and fastened to the stud wall. After all this is done, you can start the release of the material inside of the opening. As soon as an opening is prepared, further strengthen the steel channel studs and rebar, which vmontiruet deep along all directions of the wall. For reliability, all voids are filled with concrete, and metal coated with primer. If the wall thickness is more than half, use two designs on both sides of the wall, mounted it. After punching the aperture gain further tightening corners, stripes or studs. It is important to remember that the standard plan for strengthening of load-bearing walls or openings do not exist. In each case it is necessary to apply in the project organization in order that they, after evaluating the situation accurately calculate the quantity and quality of materials to strengthen. Also determines how the reinforcement and strengthening. In any case, it is not recommended to engage in the strengthening of support structures, it is easy to make a mistake or make insufficient gain, then critically increases the chance of collapse of not only the walls, but the building entirely.